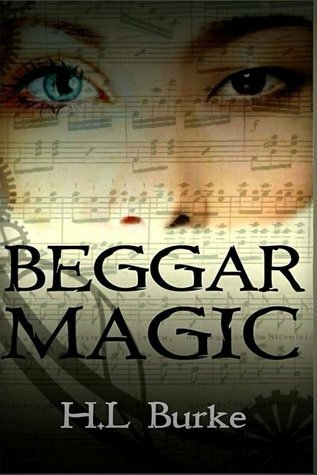 Beggar Magic by H.L. Burke was the April read for the Fellowship of Fantasy book club. I zipped through this book in less than a week and loved every word of it. Burke has a sweet, easy to read, fun writing style that has not disappointed me yet. I tried to summarize the story myself, but I feel like I’m making a hash of it, so I’ll just share the blurb from the back of the book and then move on to my thoughts about the book. This is a well-paced adventure story. A stand-alone, the story wraps up rather nicely, though I feel that there is definitely room for more stories set in this world. While we get a fair view of Gelia itself, we only get a glimpse of the wider world Gelia is part of, and many questions about the world and the Strains are left unanswered. I loved the fantasy feel with a hint of steampunk flavor to the world, as well. The characters are delightful and quite real. I enjoyed the stark differences between Leilani and Zeb, and the way that it affected their friendship throughout the story. I liked that the drama moments did not get too drawn out. When Leilani and Zeb had a fight, they sort of stomped off to their corners and dealt with it, and then returned to being friends without too much unnecessary angst dragging on. I liked that Leilani’s parents were cautious and strict, but not in a way that made them into caricatures in any way. They were very real, despite being fairly small roles in the story. There is a sweet splash of romance in the book as well, between Leilani and my very favorite character who was one of the deaf guards – which was done very well. I don’t think I’ve actually ever read a fantasy story that included a deaf character before and I felt that Burke did a wonderful job with it. She also created her own form of sign language for the guards (most of them are deaf) because she felt that certain signs in ASL would not have the correct context in her fantasy world, so I appreciated the world-building aspect that this element brought into the story. It is a very dear little tale, of friendship, betrayal, pride, and loyalty. And while you may be able to figure out some of the twists before the big “aha!” moment, I don’t think you’ll mind, because you’re going to be reading this book for the characters and the world. But if the mystery takes you by surprise as it did me, that’s just the cherry on top. As an added bonus, the writing style has a flow to it that lends itself well to reading out loud, which I always appreciate. Ooh, this one looks like a good one! I read Deborah’s blog and I was really interested. And now your review has reminded me how much I want to read this!! It was really good! Very sweet and fun and just a truly enjoyable read. This looks like a great book! I’m going to add it to my TBR.